We’re so excited to announce the launch of the Virtual Free Library at Suburban Station, an awesome undertaking made possible by the Free Library and our partners at Dunkin’ Donuts, SEPTA, and Titan. 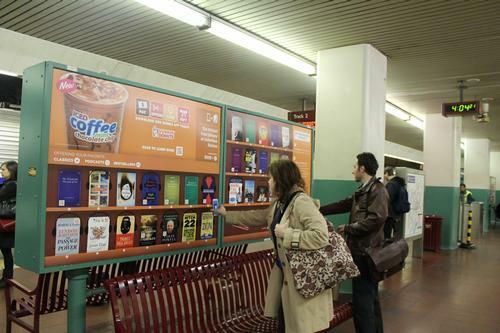 The Virtual Library—believed to be the nation’s first in a train station—is featured on more than 70 advertising boards throughout Suburban Station and is home to a selection of classic and bestselling ebooks, as well as podcasts from our ever-popular Author Events Series. More than 50 titles are available for download via QR code right to commuters’ mobile devices. These hand-picked titles offer just a taste of the Free Library's extensive digital holdings, which include access to more than 80,000 ebooks, 8,00 audiobooks, and 1,000 author podcasts! In addition to the Virtual Library at Suburban Station, SEPTA will recognize National Library Week by sponsoring the “What are you reading?” giveaway. 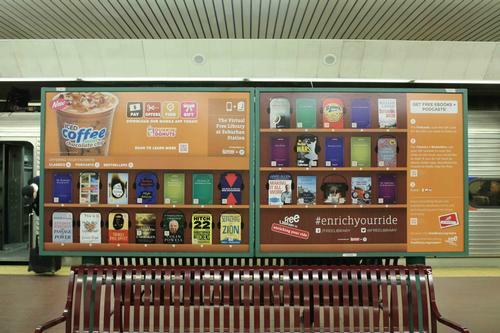 Through April 16, you can submit the titles of the books you're currently enjoying to SEPTA’s Facebook page and the @SEPTA_Social Twitter feed using the hashtag #enrichyourride to win prizes, including a monthly transit pass, Dunkin' Donuts gift pack, and front-row seats at select author events. Enrich your ride with reading! Be sure to pop by the bustling Suburban Station and try out the Virtual Free Library for yourself. Tell us what you think on our Twitter feed, and don’t forget to check out SEPTA’s great giveaway! Check out the Virtual Library at Suburban Station! Scan the QR code of the book you want to read or podcast you want to listen to. I pass Suburban on the train and I'm always curious about what it's like there. This is a reason to visit!